System Explorer for Windows is a free application that allows deep system and hardware inventory for a local or remote computer. 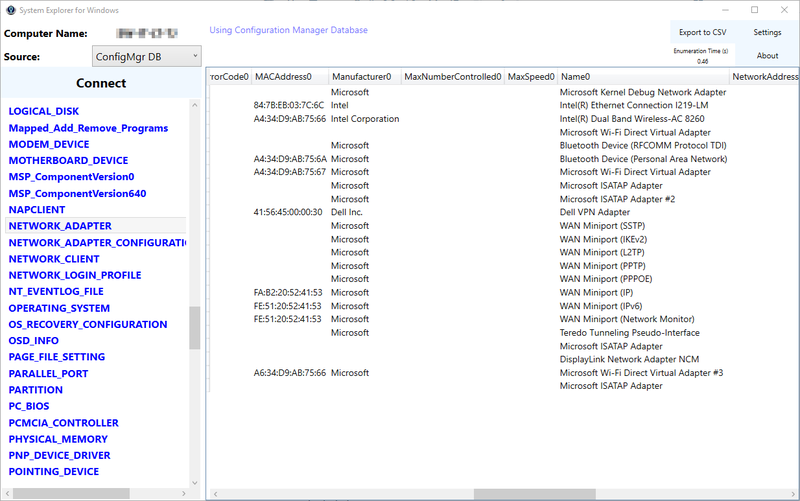 It exposes Win32 classes from WMI in an easy-to-use Graphical User Interface, and for enterprises that use System Center Configuration Manager, it can also connect to your SCCM database and retrieve hardware inventory data, which means you can always browse the hardware inventory whether or not the target system is online. The application is coded in PowerShell and uses WPF. A minimum of PowerShell version 2 is required. You must have rights to browse the CIMv2 namespace in WMI on the target system. To use the Configuration Manager capability, you must have a minimum “db_datareader” access to the Configuration Manager database. Upon opening, the computer name of your current system will be displayed. If you wish to connect to a remote system, simply enter the computer name and click Connect. If you do not have permission to access WMI on the target system, you will be prompted for credentials. Client WMI. This source displays some of the most commonly used Win32 WMI classes and exposes data you will most likely want to view, as seen in the screenshot above. 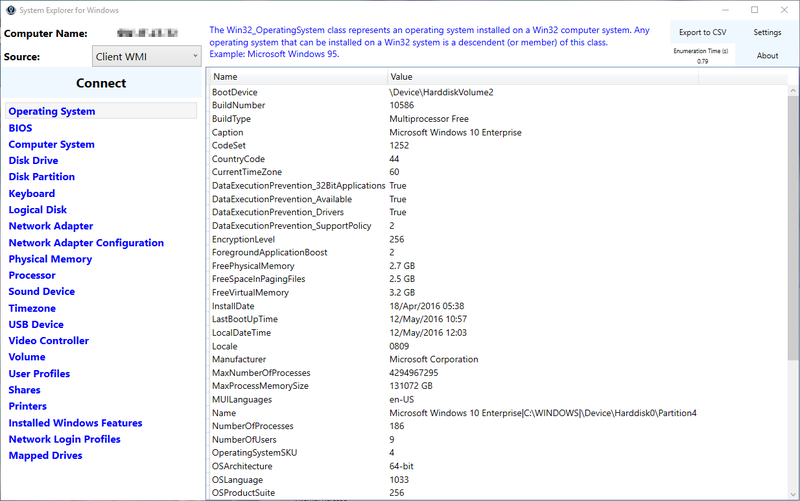 Client WMI (Full). This source displays many more Win32 WMI classes and allows for a deeper system and hardware inventory. Note that not all Win32 classes are exposed. Classes that are not useful or typically take a long time to enumerate are not included. ConfigMgr DB. This source displays all the “v_GS” views in the Configuration Manager database and filters the results based on the ResourceID of the target system. Note that even though all the “v_GS” views are displayed here, not all views or columns will necessarily be populated with data. The data returned depends on the hardware inventory classes you have enabled in your Client Settings. To enable use of the Configuration Manager database, click Settings, check the box and enter the SQLServer name (and instance where applicable) and the database name. Click Save to store these settings in the registry. You can export the currently displayed data into CSV format to facilitate reporting or advanced searching and filtering of data. Simply click the Export to CSV button. When using a WMI source, the class description is displayed at the top. Simply click the description to see an expanded view. Where only one instance is available in any WMI class, the data will be displayed in a list format. Where multiple instances are present, the data will be displayed horizontally with each instance on a new row. 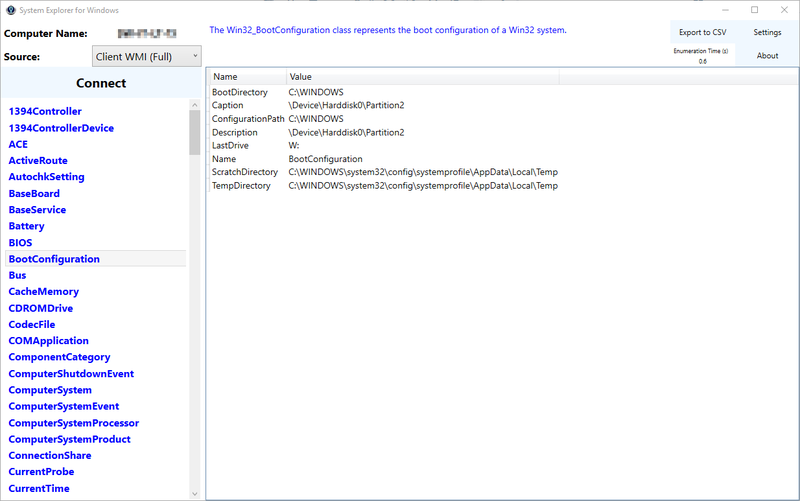 For the ConfigMgr DB view, data will only be displayed horizontally.